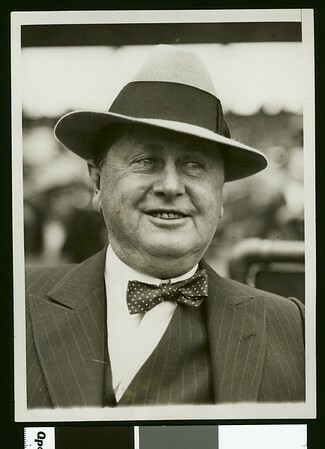 Photograph of William Wrigley, Jr., owner of the Chicago Cubs. "Associated Press Photo | From New York | Caution watch credit | Owners of the Cubs | William Wrigley, Jr., owner of the Chicago Cubs, who is seen [g]oing around these days with a wide smile on his face. | fs 9/19/29 | ca" -- typed noted attached to verso. "Received. Examiner reference library. Sep 24, 1929" -- stamped on verso.